Product code: ES7322 Categories: Modern & Retro Jewellery, Modern Rings & Engagement Rings. Made to such a high standard of finish and quality comes this very elegant scalloped shaped Art Deco style emerald and diamond ring that will always looks so incredible on the finger. Not only is this in a style reminiscent of the Art Deco period, but it is also set with genuine antique cut diamonds. In the centre is a genuine antique European cut diamond that measures 0.08 carats and is highlighted by the addition of thirty single cut diamonds on the top and a further four on each side. The total weight of these additional diamonds is 0.44 carats, making this ring have such an incredible sparkle and elegance to it. The charm of having genuine antique cut diamonds really makes this even more special than an ordinary modern ring trying to look old. 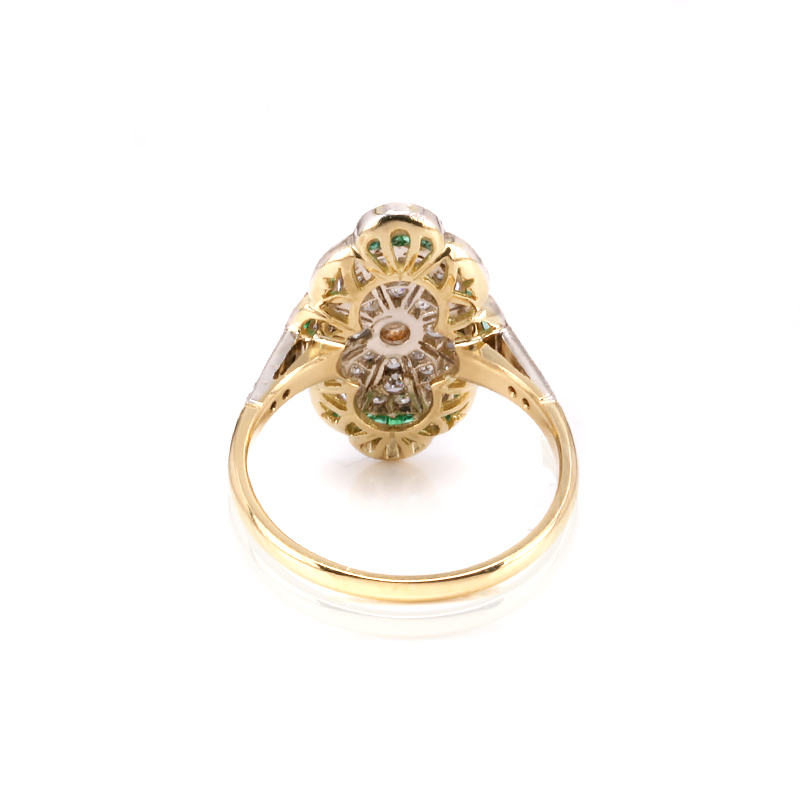 The detail is just stunning as are the thirty-four emeralds which really make this ring stand out even more. With the emeralds having a total weight of 0.47 carats, the vibrant green colour really makes them stand out so well and will captivate anyone who sees it. The design of this ring is truly spectacular and the top of the ring measures 13.9mm across by 21.2mm and even looking at the ring from under shows such incredible and intricate detail. For any finger and any occasion, this emerald and diamond ring will certainly be admired. Tag: Emerald and diamond ring. Set with genuine antique cut diamonds, this emerald and diamond ring is just spectacular.